Croc embossed flat wallets in chocolate brown with crystal trim fits great in any handbag with its smooth, sleek style - now reduced from $19.99 to $14.99! 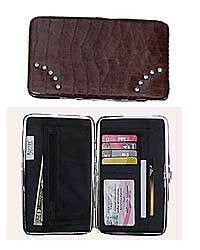 This wallet opens fully and has space for credit cards, change, and bills. There is also 2 additional slots and a see through drivers license window and the measurements are 7" x 4 1/2".